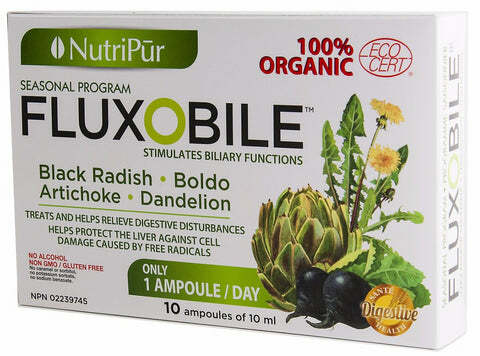 Flux-O-Bile is a complete 10-day liver cleansing program, based on traditional herbal medicine. This 100% Organic liver cleanse restores better digestion by stimulating biliary functions. Its fast acting liquid in ampules that eliminates accumulated toxins rapidly and effectively. Flux-O-Bile aids in the elimination of bile and improves the functioning of the liver, gallbladder and kidneys. It should be used for 20 days, four (4) times a year, preferably with the change of seasons. Flux-O-Bile is highly recommended before starting a weight loss program or before planning a pregnancy. 100% Organic certified Ecocert. Contains no colours, flavours, sweeteners, or preservatives. Contains no nuts, dairy, eggs, gluten, sulfites, MSG, solvents or contaminants. Contains no alcohol. Boldo Leaf: Boldo stimulates the secretion and elimination of bile, allowing for better digestion. It’s also recognized to calm gastro-intestinal spasms. Boldo has a long history of use as a liver tonic by the indigenous people of Chile. Clears up complexion for radiant skin. Feel healthier and enjoy a more active lifestyle. Better general health before planning a pregnancy. Adults (As a liver cleanse): Take one ampoule in the morning before breakfast in half a glass (125 mL) of lukewarm water or juice and preferably a minimum of 30 minutes before breakfast. Continue for a minimum of 20 days. Repeat at every change of season (4 times a year). Flux-O-Bile can also be used when suffering from indigestion or when feeling digestive discomforts after a meal. In this case, it is recommended to take Flux-O-Bile with hot water.